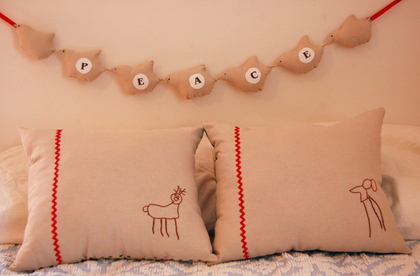 Peace dove garland, and embroidered Rudolph pillows based on the boys drawings. You know, when I took this photo, I was attempting to evoke a feeling of bright holiday coziness, but now that I look at it all I can think about is how much I would love to take a winter's nap right now! A very very loooong winter's nap. Oh. But. I suppose I'll raincheck that for January, because right now there is fun to be had, merrymaking and feasting to happen, and much celebration of and with the love and light in our lives. Solstice and Christmas are upon us and there is much excitement in the air and in the stars and in our home. Everything feels magical and warm. And so now it's time to say goodbye for a week or so. If you've got any holiday worry and stress left in you, you simply must read this by Siri. A brilliant reminder. We''ll have our own to-be-remembered 'exception to the tradition' this year when we'll celebrate Solstice the day after Solstice because Mama didn't realize the date she was looking at was for Universal Time. Sigh. Shake it up, indeed. However you celebrate this week, I'm wishing you many blessings of peace, light, joy and magic!